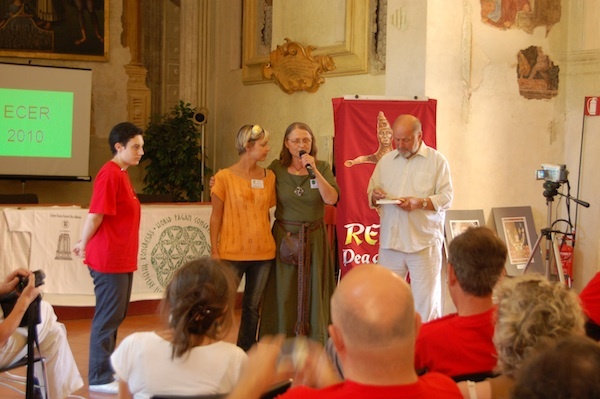 From 25 to 29 August, the city of Bologna in Italy hosted the European Congress of Ethnic religions. Referred to as ancient pre-Christian (pagan) or native (indigenous) religions. The first conference was held in Vilnius in 1998, and the for runner of this inter-religious union was named the “World Congress of Ethnic Religions. ” During the past 13-years this religious movement has been growing, and representatives meet regularly in other European countries. This year it was in Bologna with about 100 delegates from Denmark, Norway, Germany, France, Greece, Lithuania, Latvia, Portugal, Czech Republic, Poland, Ukraine and Russia. Andras Corbin Arthen a member of World Religions Parliament Council also took part in the conference. He was glad to say that the Parliament can now accept European indigenous religions into the department that represents World Indigenous Religions. We were most interested in the Italians, who have invited us for the meeting in Bologna. Italian old-believers only recently appeared in the past 3 years in the Congress. It appeared that even in the center of Catholicism – in Italy, there are some old-believers organizations. The conference was organized by the Association Religiosa Gentile and was assisted by other organizations. A tour through Rome was led by Prof. Renato Del Ponte, of Movimento Tradizionale Romano. Congress was opened by the Italians, using a Roman rite in Latin. What was most impressive, was getting acquainted with the oldest center of Rome – the Roman Forum. 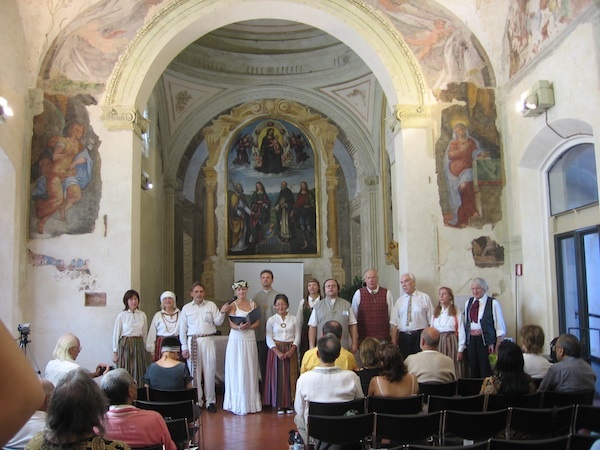 In Rome Traditional Pietas people invited us to Minerva – the arts and crafts patrons temple, to attend a ritual. There were inscriptions hanging outside the temple, saying that this was Minerva’s temple. Dressed in Roman togas, young Romans performed rituals with offerings and saying prayers, which were reconstructed from ancient Roman sources. 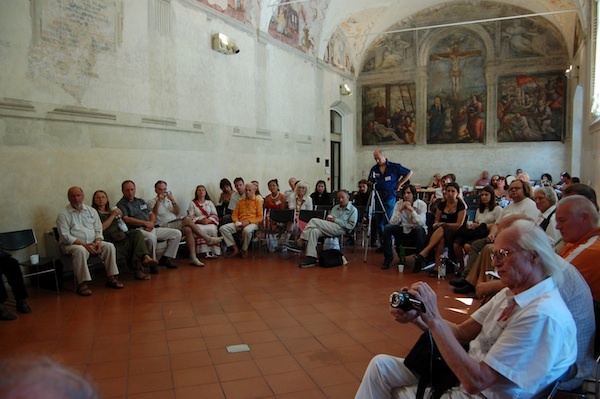 The conference was held in the center of Bologna in Baraccana Palace in former monastery – the hall of which was decorated with frescoes of early Christian motives. There were individual delegations introductions and presentations of their activities. The third day was designated to learning about different indigenous religious ethics. Of all the reports from the traditions activities , the Danish Forn Sidr – was probably having the most success in Denmark. The organization was founded in 1997 and registered as an official Danish ethnic religion in 2003. They even have their own cemeteries, and their marriage ceremony has now been legally recognized. Other Scandinavian old-believers such as Icelandic, Norwegian, Swedish are also thriving and have National recognition. After discussion it was decided to change the name ” World Congress of Ethnic Religions” (WCER) to the “European Congress of Ethnic Religions (ECER), because 13 years of operational experience has shown us that the biggest concern is to preserve the ancient spiritual traditions of Europe. Among the Europeans we have a lot in common and we feel the need to get together. Bologna meeting was attended by a number of important Hindu representatives. The role of India is special, and our Congress constantly keeps in touch with our Indian friends. Some have suggested we should be called Indo-European, but it was pointed out that Europe is home to Finno-Ugric, Basque and others. Why has Congress chosen to be confined to Europe? The debate was dominated by the view that Europe is suffering the most because of the weakness of its traditions, especially the spiritual ones. While Oriental cults thrive, European traditions are often seen as obsolete and archaic which only have a place in museums. However, there is an increasing awareness of the value of our own authentic cultures. The next ECER conference will be hosted by the Danish Forn Sidr.